Tonight I belong to someone, and she belongs to me. As long as the stars shine, as long as there is a heartbeat in me, as long as you're out there, nothing will change what we share. 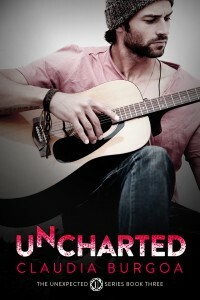 Uncharted is the third book in the Unexpected series and is Jacob and Pria's story. You don't have to read the other two, in order to enjoy this one as each story is about different characters throughout the same family. However, the first two books are well written and beautiful so I would definitely suggest you pick them up! Jacob and Pria met in college and had a whirlwind, week long, romance before fate tore them apart. Ten years later they meet again but they are now very different people, both having gone through difficult and life altering times. Jacob is not the "happily ever after" type of guy. He is in to his music, loyal to his two twin siblings and just wants to have a laid back life doing his own thing. That is before he meets Pria who turns his heart, and makes his soul quiver with love. Pria has an extreme family obligation and doesn't believe that her life will ever be her own. She is expected to take care of her sister who is suffering with a deadly disease. Her mother is not warm or loving at all and Pria always feels like she can't do anything right. Then she meets Jacob and starts to hope for something more for herself but life gets in the way. Will she ever see Jacob again? I finished this book about a month ago and I am still feeling the book hangover. These characters were brought to life for me and I can't seem to let them go. The story is heart pounding, moving and emotionally driven. Even with all the heartbreak this story has, you will be routing and cheering for Pria and Jacob from the beginning and you won't stop hoping for "happily ever after' till the very last word. 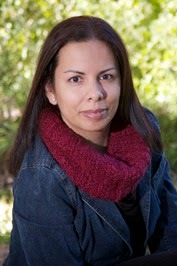 I am a HUGE fan of Claudia Burgoa's and have been since her very first novel. Her writing style is emotional and well thought out. Her books always seem to speak to me and she has this way of making all her characters come to life so that the reader has a REAL investment in her stories. You won't be disappointed if you pick this book up and read the companion novels as well. 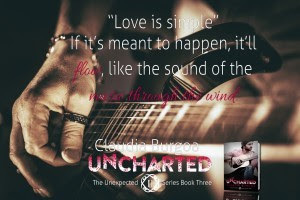 The Unexpected Series is so beautifully written, it is NOT a series you want to miss.